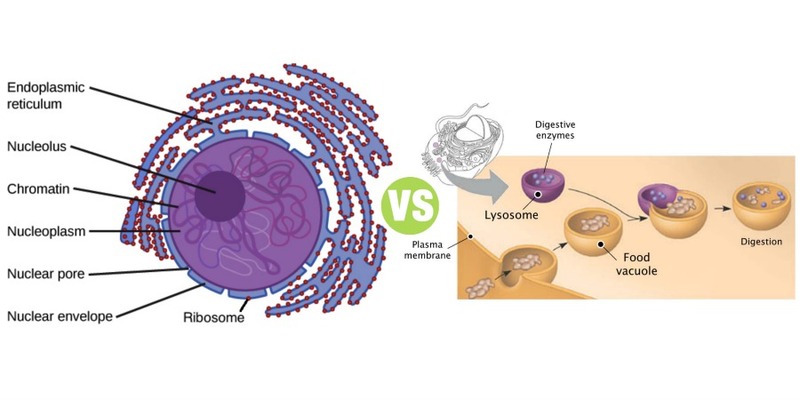 Summary: Difference Between Ribosomes and Lysosomes is that Ribosomes are the organelles without limiting membrane. These organelles are granular and small dot-like structures with a diameter of 15 nm. While Lysosomes are the membrane-bound vesicular organelles found throughout the cytoplasm. Ribosomes are the organelles without limiting membrane. These organelles are granular and small dot-like structures with a diameter of 15 nm. Ribosomes are made up of 35% of proteins and 65% of ribonucleic acid (RNA). RNA present in ribosomes is called ribosomal RNA (rRNA). Ribosomes are concerned with protein synthesis in the cell. Free ribosomes that are distributed in the cytoplasm. Ribosomes are called ‘protein factories’ because of their role in the synthesis of proteins. Messenger RNA (mRNA) carries the genetic code for protein synthesis from nucleus to the ribosomes. The ribosomes, in turn arrange the amino acids into small units of proteins. Ribosomes attached to rough endoplasmic reticulum are involved in the synthesis of proteins such as the enzymatic proteins, hormonal proteins, lysosomal proteins and the proteins of the cell membrane. Free ribosomes are responsible for the synthesis of proteins in hemoglobin, peroxisome and mitochondria. Secondary lysosome, which is the active lysosome. It is formed by the fusion of a primary lysosome with phagosome or endosome. Lysosomes are often called ‘garbage system’ of the cell because of their degradation activity. About 50 different hydrolytic enzymes, known as acid hydroxylases are present in the lysosomes, through which lysosomes execute their functions. Macromolecules are engulfed by the cell by means of endocytosis (phagocytosis, pinocytosis or receptormediated endocytosis. The macromolecules such as bacteria, engulfed by the cell via phagocytosis are called phagosomes or vacuoles. The other macromolecules taken inside via pinocytosis or receptor-mediated endocytosis are called endosomes. The primary lysosome fuses with the phagosome or endosome to form the secondary lysosome. The pH in the secondary lysosome becomes acidic and the lysosomal enzymes are activated. The bacteria and the other macromolecules are digested and degraded by these enzymes. The secondary lysosome containing these degraded waste products moves through cytoplasm and fuses with cell membrane. Now the waste products are eliminated by exocytosis.